you know, feel free to donate to keep the site up ;) Image source. Well, the blog is two years old as of yesterday - it's hard to believe that it's already been TWO YEARS since I started posting about whatever happened to interest me as a way to clarify my own thinking, generate ideas, connect with friends and strangers, and try to contribute to the greater public discourse in some small way. This past year has been a particularly big year, both for the country and for me personally - the country re-elected its first black President (which I think is almost more important than his initial election to office - I thought the USA would find it much more difficult to actually be governed by a black man than to elect one as President), and my wife and I had our first child, the Babycrat. We have big plans in store for 2013 - we'll see what all we're able to accomplish! About the blog - I've had a great time writing it, and I plan to continue to do so for the foreseeable future. According to the sidebar, I've posted 350 articles thus far! There's a lot of great stuff back there in the archives, so if you're relatively new to the site or only visit occasionally, check out the archives or try out the search button and see what you find. I even browse my own archives sometimes and am occasionally surprised by my own past posts! I remain particularly proud of my Wedding Week posts, so be sure to check those out, if you haven't yet. Obviously, I'm not a professional blogger, and I don't write this blog to make money. Readers who have been around for a long time may remember that I tried putting up ads for a little while to help cover some of the costs of running this blog (yes, this blog requires resources other than my time, which I happily donate), but the ads didn't bring in any meaningful sum and made the place as gaudy as the Vegas strip, so I took them down. Nevertheless, I'd rather not be in the red as a result of this blog, so I figured I'd go the NPR route and take the blog's birthday as a once-a-year opportunity to invite any of you all out there who feel so inclined to donate "whatever amount fits your budget," to quote Steve Inskeep, if you value this blog and want to help me pay the bills for running the site. The best way to contribute is via PayPal to angrybureaucrat@gmail.com (since PayPal doesn't charge fees for a simple personal transfer/gift) - but if you don't have a PayPal account, you can donate with any credit card via the Support button on the right. Whether or not you're inclined to donate to support the site, I am deeply thankful for the support you show me through your readership, comments, questions, insights, disagreements, criticisms, and general engagement. Thanks, everyone, for another fantastic year - and I look forward to another great year of blogging in 2013! 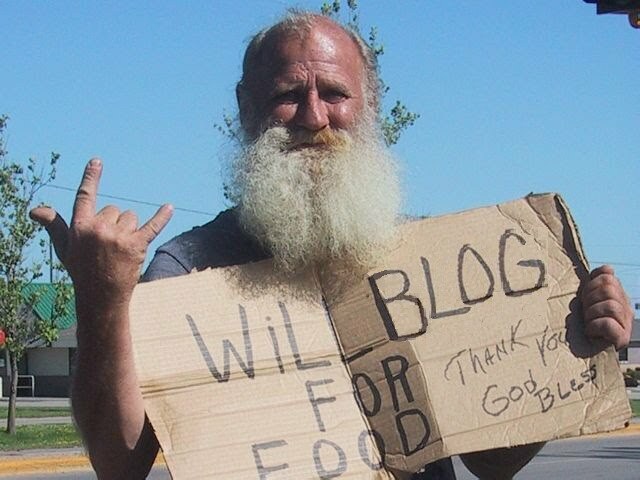 Oh yeah - you keep rockin' that bloggin', old dude. Image source. How's Babycrat? Us pols demand pics! Anonymous: Ha ha, I didn't realize the Babycrat was such a popular topic! Well, I am nothing if not responsive to my readers. I'll copy some photos off the camera and do a Babycrat update soon, I promise, perhaps together with some reflections on being a father to a newborn.